At the weekend I popped into our local newsagent and bought a lottery ticket (which didn’t win) and asked for a packet of Tic Tacs. The man behind the counter grabbed these off a Tic Tac stand, and I paid and dropped them into my pocket. 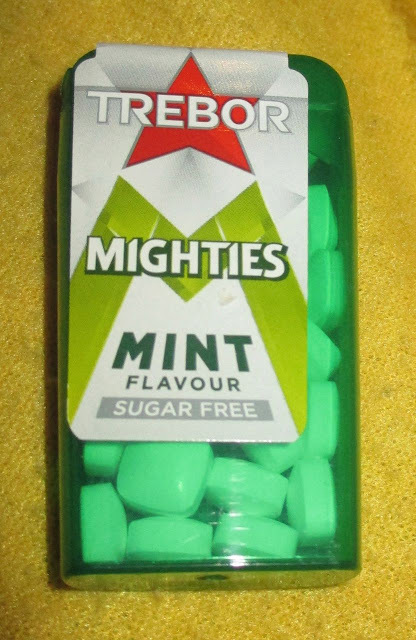 It was only when I got home I had a proper look at them and realised they weren’t Tic Tacs at all, they are Trebor Mighties Mints. The sweets in the packet are sugar free, so they are kinder on the teeth. I’m sure they have less calories too, but it you are worrying over the calories in a tiny mint you might be over doing it. I tried one and I couldn’t quite gel completely with the flavour. They are mint, but I didn’t think it was a clean mint flavour, I thought it tasted a bit like mouthwash, and not a pure peppermint. I liked the strength of the mint though, it was good and strong, and I could feel the coolness in my nose! 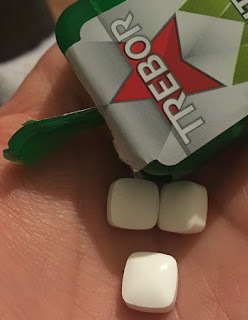 That’s pretty impressive for such a small mint. They certainly made my mouth feel fresh too, so they did their job. I just don’t think they’d be my first choice of mints, but they are nice enough. Given the choice, I’d rather have a packet of Trebor Extra Strong Mints, there flavour has the edge, and a good kick of strength. These are not macho Viennese Whirls, but they feel very middle class biscuits. I find it difficult to think of another hight street store that would carry Raspberry and Prosecco Flavour Viennese Whirls, but for some reason they fit right in at Marks and Spencer. 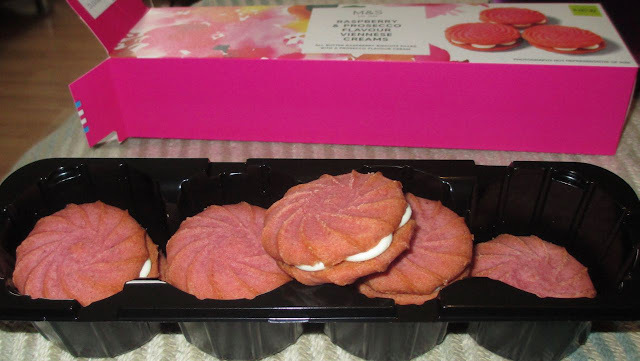 The biscuits are very pretty, they are a lovely shade of pink, and are neatly shaped with a white filling. 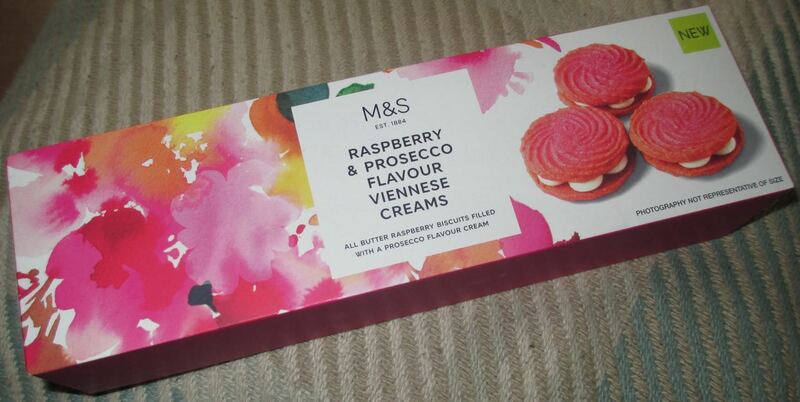 The biscuit section is raspberry flavoured and the filling is where the Prosecco flavour fits in. The Viennese Whirl biscuits have a good texture, they are fairly soft, but still crumbly and they sort of melt in the mouth. The raspberry flavour is most dominant, and the flavour of the Prosecco, is mild. I actually tried some of the cream filling on its own to try and single it out, and it was still delicate, with an almost floral undertone. The flavour combination worked very well, and although it started off by sounding like a bit of a novelty, I was totally taken in by them. They are fun, but they are designed to impress. Anyone you offer one to will be sure to ask where they are from, as I think they will be wanting their own box. The flavour combination is a complete win, even if you think pink biscuits might not be your thing. Recently in the UK a program called Super Slimmers: Did they really keep it off? aired on Chanel 4. (it's available on their site for another 2 weeks to watch for free). This followed a side of diet clubs (Weight Watchers, Slimming World amongst others) that I'd never really considered - what happens if you go back to the people that had those great losses three years later and see what happened after that. Naturally I'd suspected that some people kept it off, and some people put it back on but what the small sample in the program showed was that only one of the people from diet clubs managed to keep the weight off. That person was also a bit of an extreme case - Dan Wheeler now works as a fitness instructor and excersises for two hours a day - but also eats no processed food and his only vice appears to be massive bags of Haribo. All of the other participants had reasons for falling off the wagon (so to speak) but they were varied. "Took my eyes off the ball foodwise" "I just haven't got organised on the food aspect"
It almost seems like to be a record slimmer that the goal was the most important thing, and not the health behind it. This is very contradictory to what I found through investigating the Eat To Live series - there the weight loss is almost a side-effect of the food and nutrition and not really the goal. Interestingly the three scientists involved kind of expected this - they have published papers showing that they expect people using diet clubs to regain to within 2lb of their original weight within 3 years, and only 5-10% of the participants keep it off. This seemed staggeringly low to me - as the NHS actually pay for people to go to these clubs as an obesity solution, and it's the most socially acceptable way for people to 'get healthy' along with exercise regimes. The scientists talked about blaming that old spectre of metabolism and that if you loose it too fast then your body will panic and store everything you eat (which has recently been proven to be very shaky reasoning). This has caused a new wave of supplements (such as those by EvolvHealth) in America which try to change the way that your hormones react to weight loss and to push that in the right direction. In the UK when you try to watch the show online you get adverts for over the counter 'fat-binding' pills from XLSMedical which claim to have similar effects. There is even one you take when you get hunger cravings like nicotine replacement therapy. I have to be skeptical though - is more medication dependancy really the answer? What happens when you live on these pills then stop taking them? The scientists asked really didn't think these were the answers either. While the soundbites they used at the start made them sound a little non-expert towards the end they were allowed to express some valid and well backed up opinions, and all of them essentially said that eating more healthfully would cause a reversal of the obesity symptoms. The one part that really brought the whole thing home was a 30st guy who has been going to Weight Watchers for 15 years (?!) and now has developed Type 2 diabetes. I tend to presume that the people with these issues are like smokers and don't really know what they are doing and aren't bothered by it, but this guy could recite exactly what diabetes was doing to his body and knew that it'd mean that he'd not only shorten his life, but that he'd be less active and spend less time with his children too. It makes me sad when we see people that are completely aware that they are destroying themselves and their family but struggling to do anything about it - even with expert advice. So is it just that we really don't understand how our unique micro-biomes in our respective guts work and that you can't just lose weight by reducing calories and expect it to stay off without keeping them low or exercising so much that you burn it all? Will 'Our Broken Plate' help to fix this and inadvertently did 'Eat To Live' discover a diet that causes us to terraform our gut to encourage fat burning microbes and discourage fat storage microbes? All we know for sure is that eating whole foods, and eliminating additional SOS (salt oil and sugar) seems to cause people to shed weight. And three years after those changes will we revisit to find people large and unhappy again? Who knows. 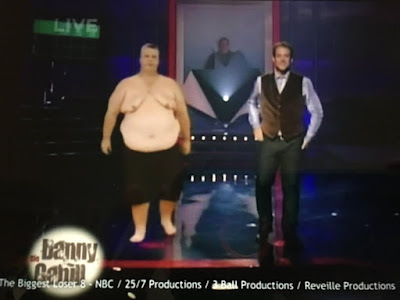 Their current research can be found on PubMed via search engines and goes into much more depth about the mechanisms behind the themes featured on the show, and what medical professionals are doing to help stop the obesity epidemic. 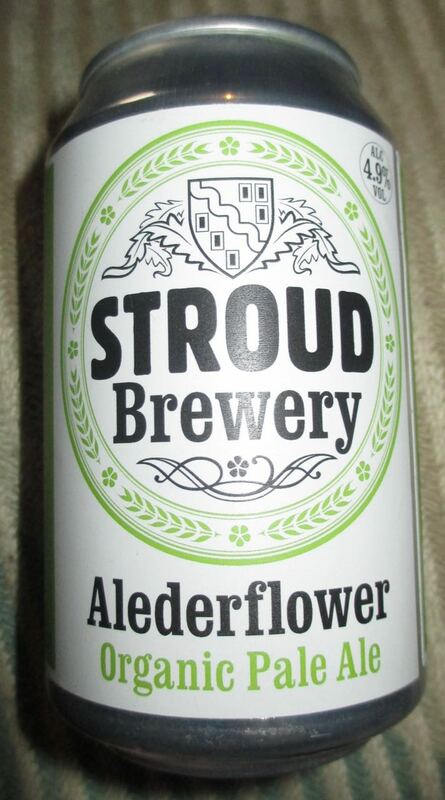 Stroud Brewery in the Cotswolds produced this Alederflower Organic Pale Ale. It was made with organic barley malt, organic wheat malt, organic Cascade hops and Nelson Sauvin hops, and infused with organic elderflowers during the brewing. Flowery pale ale doesn't always enthuse me, but I'm sure I've tried elderflower beer in past and enjoyed it. On opening the 330ml can there was a very subtle flowery smell to this pale ale, which was overshadowed by the pale malt and the light refreshing hops. This instantly felt like a spring or summer type of drink, rather than a damp windy winter, which we seem to be suffering presently. The label on this 4.9% volume beer mentioned that this was unfiltered, so it was unsurprising that it gave off a murky golden glow upon pouring. On taste there was an initial bitter blast from the mixture of hops, quickly followed by a flowery flavour from the elderflower infusion. The sweetness from the pale malt and likely crystal malt comes soon after whisking the tastebuds off into the aftertaste. Despite it's claim on the label of subtle undertones of elderflower, and its even subtler aroma, this is quite a strong bitter beer, with a kick and a punch of hops to start with, then a little taste of the flowers of summer followed by sweetness from the barley malt. I'd certainly have this again and you should not be put off by the elderflower infusion at all. We spotted these Pejoy biscuit sticks in York, from an independent import shop. 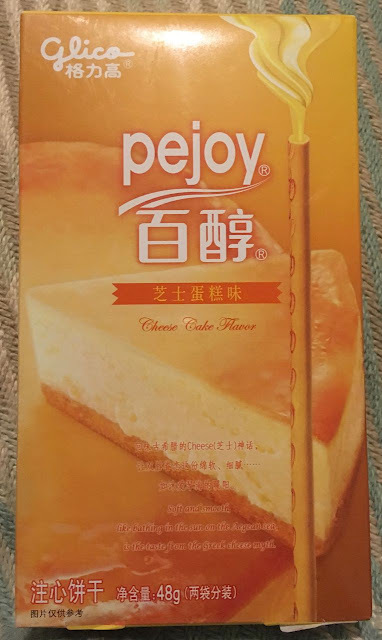 They didn’t have many Pejoy products, just this and a chocolate version, but as I hadn’t seen the Cheese Cake edition before I had to pick them up. Unlike Pocky the style of these is that the filling is on the inside of a biscuit tube. Pocky (or Mikado for its UK name) are biscuit sticks which are dipped in a flavoured coating. They always leave one end clear, so that you can pick them up without getting your fingers messy. I gave one of these Pejoy Cheese Cake sticks a try and found them to be very pleasant, but not quite as exciting as I thought they may have been. The biscuit was firm and crunchy and the filling was creamy, with a good sweet vanilla taste. The filling was soft, but as there was so much biscuit around them the ratio meant the texture felt pretty monotone. The conclusion is that these are very mildly flavoured biscuits. That makes them easy to snack on, and nice to introduce to people who are new to Pejoy. They just didn’t have the fun of finding a crazy import snack with an interesting flavour. Perhaps I’m being over picky, but these just felt more vanilla and plain that cheese cake. Way back in 2013 our London correspondent found and reviewed the two flavours of fake cronut that Greggs had made and blighted with the name Greggsnut. Three and a half years later these have made it to Greggs Bromsgrove and I got to try one. It's a curious arrangement - as those who lived through the initial hype will remember - as basically you make a doughnut out of croissant pastry and glaze it lots of times. Puddings that take far too much effort to make are certainly in vogue and so this pecan and maple affair is going to get at least some attention. The problem is that it still tastes like yesterday's croissant covered in icing with a bit of added flavour too. That's not something worth the £1 asking price when that would get you a couple of fresh today egg custards! It's an experience I, glad that I've had, but not one that I think many English people will enjoy. That said I want to try the fruit flavoured one - and try heating it up bare eating to see if it revives like stale Krispy Kreme do. 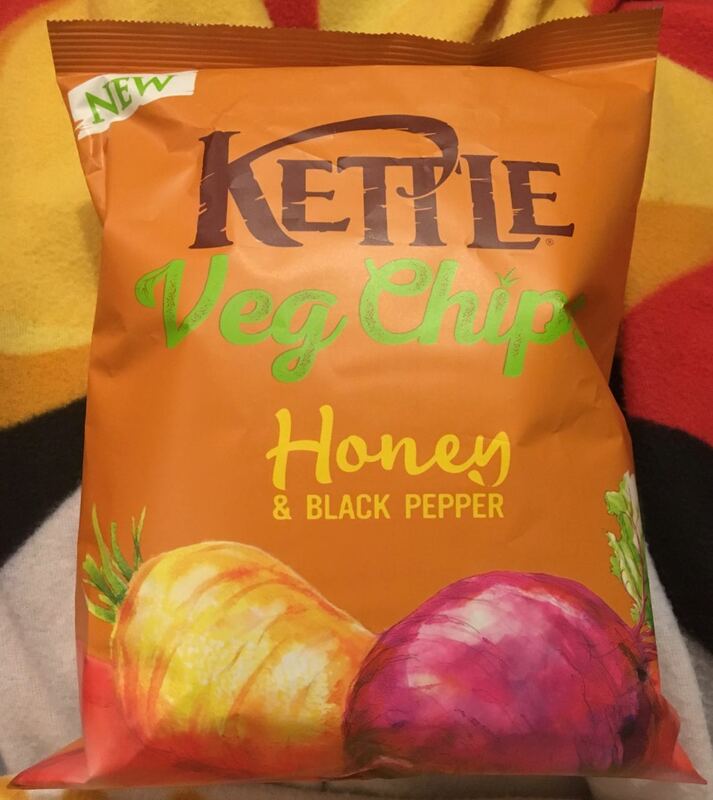 These new Veg Chips from Kettle seem familiar to me. When I read what the vegetables were they immediately rang a bell. Sweet Potato, Beetroot, and Parsnip chips were also used in the vegetables for the slightly salty Kettle chips I reviewed back in November. They have now added Honey and Black Pepper as flavouring. 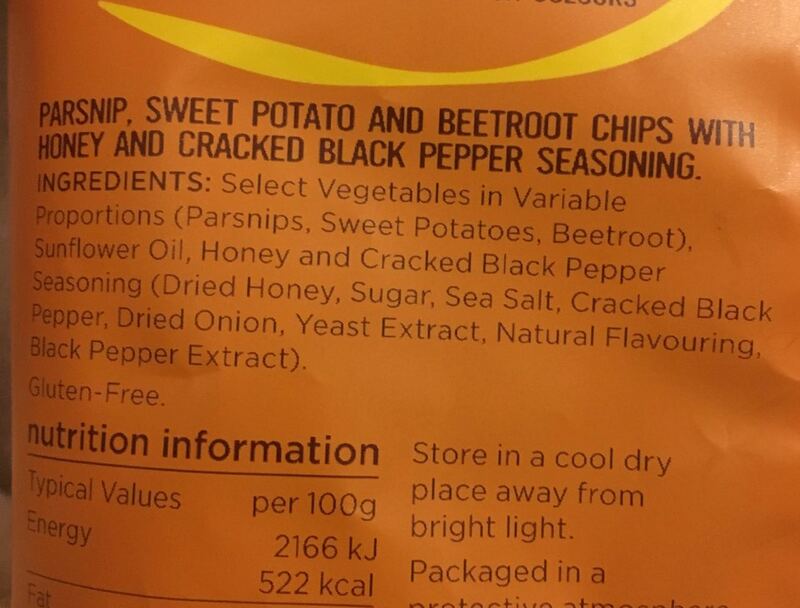 On opening the packet there was a slightly sweet and black peppery smell mixed in with the baked vegetable crisps. The parsnip crisps, beetroot crisps and sweet potato crisps looked pretty much the same as the last packet I had, but I could see light sprinklings of pepper on the crisps, mainly the parsnip and sweet potato crisps, as the beetroot were very dark purple. On taste they were pretty much the same as the last vegetable crisps I had. Of course there was more of a honey sweet and mild black pepper taste to the parsnip crisps and the sweet potato crisps, mainly to the parsnip crisps though. The beetroot crisps tasted pretty much the same as before, as they already tasted a little peppery by beetroot's very nature. These were still very tasty and healthy feeling crisps, but with a slightly, and I mean slightly, different taste than the previous lightly salted version. The 125g packet had 522 calories per 100g, with 36.4g of fat, 22.5g of sugar and 1.2g of salt. 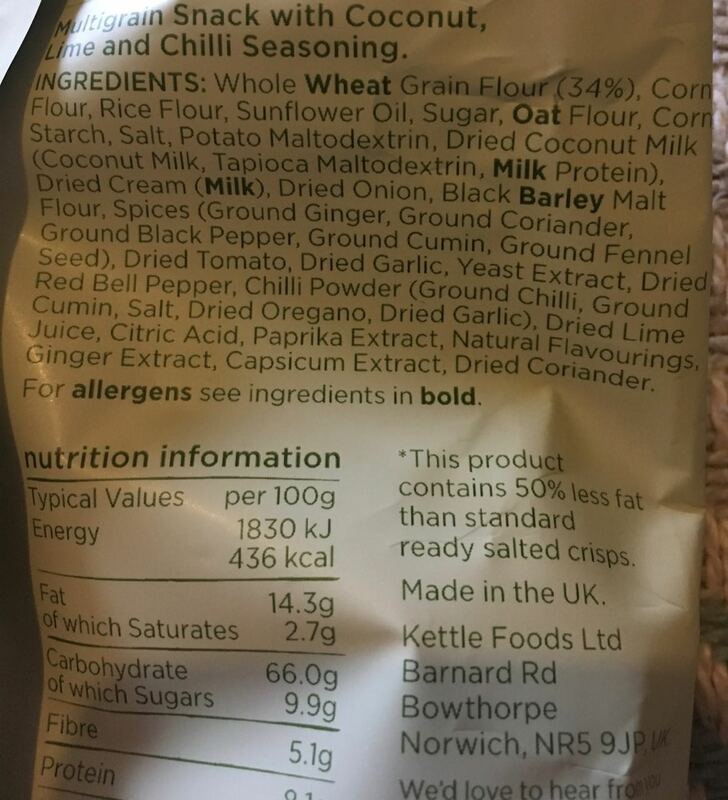 Please see the photograph for the ingredients, which again have nothing artificial. 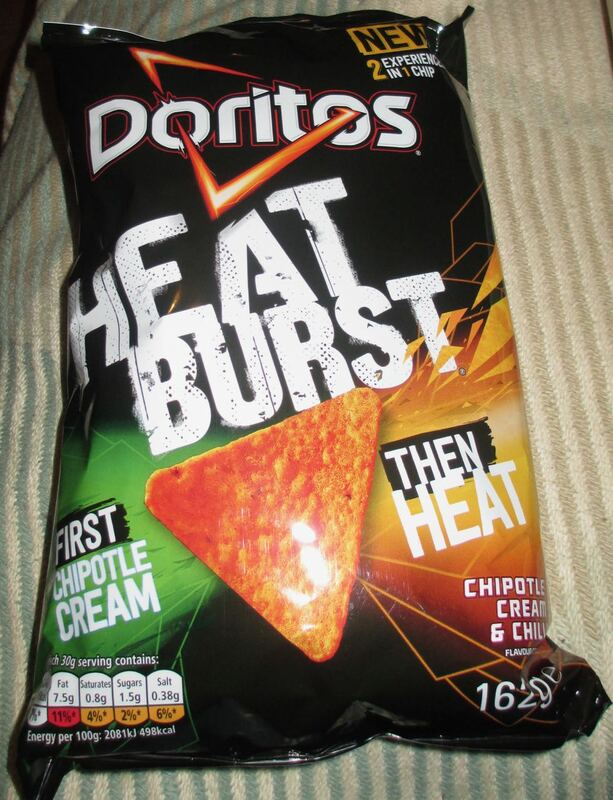 The lovely folks from Doritos sent us a bag of their new “Heatburst” Chipotle Cream and Chilli chips. 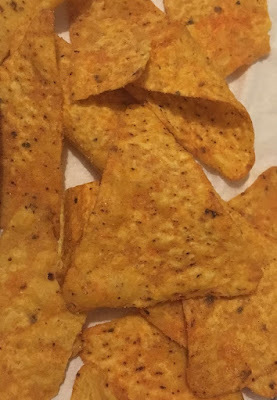 The idea of this new flavour is that it is a two in one type of product, where the seasoning on the outside of the chip is Chipotle Cream flavoured and the chip itself actually contains the chilli which is released when you bite in. 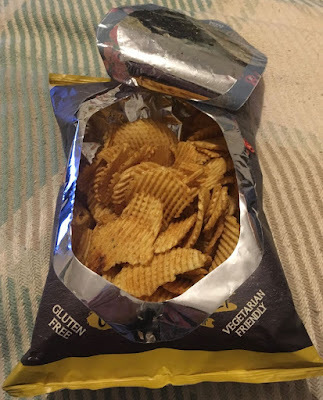 We opened up the bag and shared some out and the chips looked nicely dusted with a decent amount of seasoning. The aroma was nice and spicy, and very appealing. 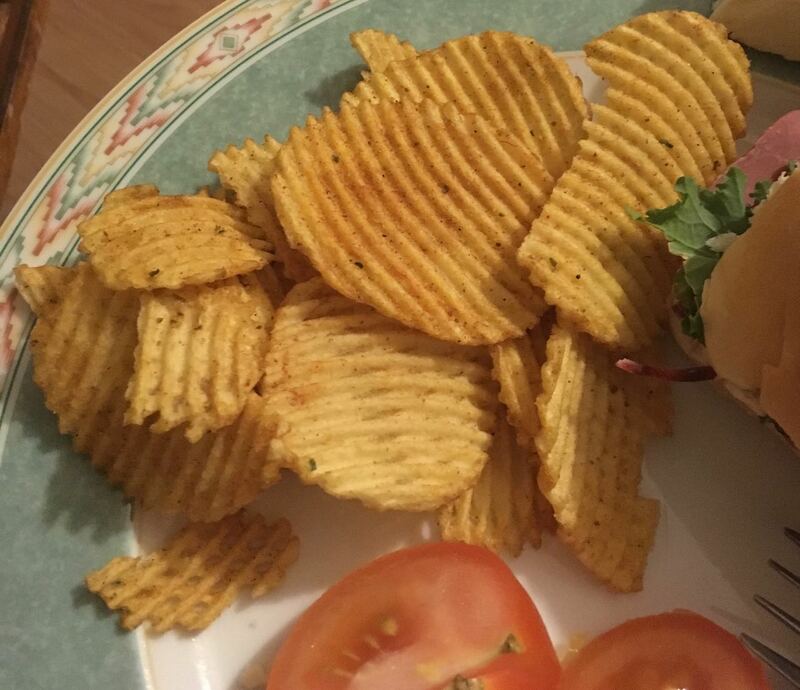 Given the nature of these new crisps I decided to start off with giving the chip a tentative lick. The had a lovely rich smokey paprika like flavour, not too hot but with some fab warm tones. Next I decided to chew said chip and that is when the Heatburst kicked in. These new Doritos Heatburst certainly have a kick. The heat is hot and the tingle in my mouth lasted a good few minutes after I’d finished munching. I tried another one and allowed it lull me into a false security, I let it dissolve on my tongue, giving off its gentler smoky flavour, and then I bit in and allowed the heat to hit. Wow, I have to admit to loving the two toned flavours. It is greta fun and works really well. The issue can be summarised by remembering that you cannot eat a Dorito without chewing, so the heat burst is inevitable! I’ll certainly be getting them again though, the flavours are fab and the chilli heat is wonderfully moreish. This is the first time I've seem Walkers put their crisps in a tube, it certainly works well for some other brands. It means that the crisps have to be uniform in shape so that they can fit inside. 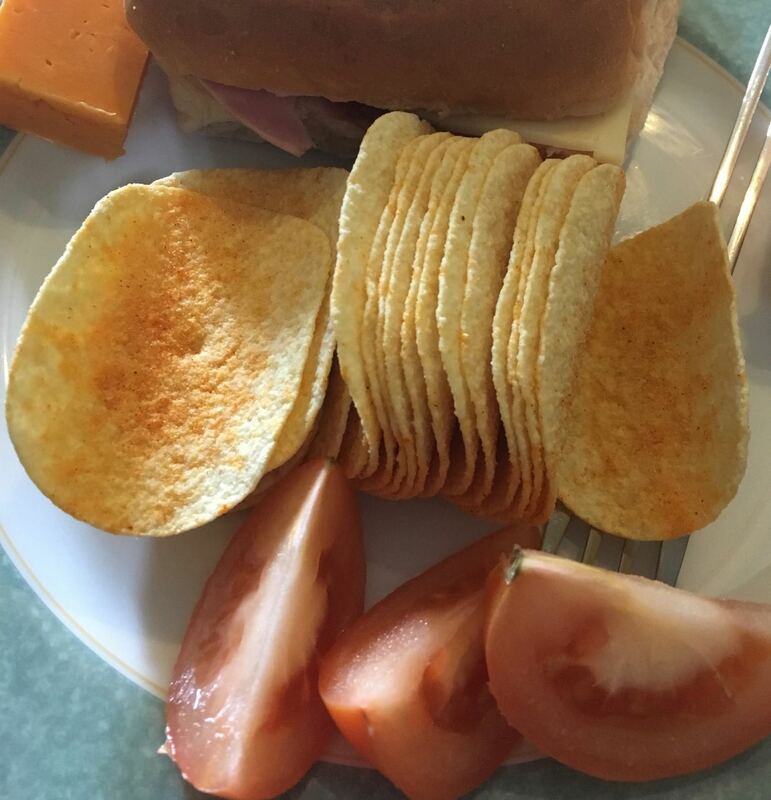 These crisps are not proper slices of potato like regular Walkers, these crisps are re-formed and stacked. Hence the name, Walkers Stax. The tube itself was slightly annoying to open. There was a label on the side that suggested you had to squeeze the top of the tube to ease the top off. This is the kind of packaging that reminds me I’m not dextrous. I squeezed, and nothing happened, the top stayed exactly where it was. I realised that around the edges there were tiny bits of cardboard pips holding it on, I ran my fingernail along these to help break the seal and ended up bending my nail back - ouch. It worked though, the next I squeezed the lid popped off, literally popped, as it broke the seal underneath of the pull tab too. Oh well, at least they were open. I can cope with crisp bags far more easily. Anyway the stack of Walkers Stax, looked nice and I poured some out onto my plate. The texture was crunchy and nice and the flavour was pretty decent. The paprika was there, and added a warmth, but there was no heat in the spice. I could pick up on a nice smokiness to the crisps, and hint of salt that made them very tasty. The seasoning was well balanced, in a generous quantity and worked well. As much as I enjoyed these crisps, the tube packaging put me off. Other brands of potato snacks sold in a tube seem to do it better. I prefer a plastic pull off lid, although I’m guessing the all card edition is more commonly recycled. This was supposed to be a review of the wonderful fish and chips at Bromsgrove Sporting's FA vase clash with Buckland Athletic. I was working a combination of stewarding, security and glass collector and didn't actually get to try them to check that the Balti Pie was still just as fantastic. So I had to settle for a bag of Burton's Fish N Chips (which we have reviewed before). Seen here with all the barrels before the record crowd came in and drank it all. And here is what it looks like with three thousand people- which is double the grounds previous record and almost ten times that of a Normal league game. The increased security and stewarding presence enabled me to share my big bag with many new people and enjoy the savoury goodness in the unseasonably warm Feb evening. Not as satisfying as warm fish and chips and pie at the football then, but they did the job. And Sporting won two nil! I seem to be stumbling (sometimes literally) over various rye ales lately. The Great British Brewing Company, in Twickenham, produced this Red Rye IPA. This 4.7% volume ale has an preliminary citrus hoppy smell on opening. As the name suggests it has the usual almost glowing red colour on pouring from the 330ml bottle. The label on the bottle mentions passion fruit, peaches, pine and citrus fruits. There was a definite fruity citrus smell from the beer, and I'd probably go as far as to say that could be passion fruit and peach from the hops mixed in the with malt barley and spicy rye aromas. I picked up on a definite initial citrus fruity bitter flavour from the hops, which then mixed well with the woody pine undertones; there was then sweetness from the malt barley which merged with the strong spiciness from the rye. This Red Rye IPA certainly gave a joyride of flavours from start to finish. This is a proper craft beer, well thought out and delivered to my palate. Yum! I'll certainly keep my eyes open for other rye beers, as well as pop back for another bottle or two of this one. 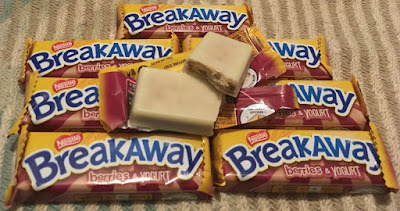 I was looking for a nice afternoon treat for my lunchbox and spotted these new Berries and Yoghurt edition Breakaway bars. They come in a multipack but are individually wrapped. I don't buy a lot of Breakaway bars, but the new flavour sounded rather tasty. Inside the wrapper there is a Breakaway bar that looks like it is covered in a pale coating even too white for white chocolate. The smell is prominent and it smells very fruity. The taste too is very strong of the berries, and the bar has a mixed berry jam like taste. I could pick up on raspberries and strawberry, all sweet, juicy and pleasant. The yoghurt flavour in the coating was creamy with just the slightest hint of sour, which distinguished itself as a proper yoghurt flavour. The biscuit inside the Breakaway bar is generous, and give these bars a solid substantial feel. The firm texture is pleasing and nice to munch on. The flavour from the biscuit itself was quite mild, overpowered by the fresh berry taste. I still rather liked them, and am looking forward to eating them as a treat at work, after my lunch. They are only 101 calories per bar, so not too much to feel guilty about either. The final tradition of the Blackpool trinity of Tower, Fish & Chips & Rock is - well - rock! This is more ordinarily brought home instead of consumed at the sea-side and so is only just now getting reviewed. Most people probably don't taste the rock that they buy, and consequently most people probably don't finish the rock they receive. I admit that here I wasn't expecting much - buying what is probably last season's rock for 'six for a pound' and going purely on the novelty flavours goes against every snack-head instinct I've developed over these past years. So here goes. I thought I'd start nice, then get nasty and finish with the traditional to at least cleanse the palate a little. First we have the Kinder Egg. This was a white stick with a brown swirl and basically tasted like a sweeter rock with a yucky chocolate taste lurking at the back. Nothing special, didn't have to spit it out, and it was crispy but not hard. Next up we have the one alcoholic rock I purchased - Prosecco. They had lots of ales and ciders but very few wines. I think this is because they struggled to get an authentic flavour as this had neither fizz, nor a wine like taste. This one was a bit fruity, and too soft for my liking. Less pro-secco and more amateur-secco. Next up was one of the two I was suspicious of -Hot Chocolate. Would they even attempt the heat? Or the chocolate? Turns out this is just a stronger version of the evil background Kinder Egg flavor, like a hit of pound shop chocolate with sugar on top. It had a very lingering aftertaste which caused me to try the next flavour with a little more bravery than I'd have expected. Ah Fish & Chips - what had drawn me to the seaside was now causing genuine fear... Would this be vinegar flavoured rock? When I opened it I discovered that it smelled like lemon? It was very, very soft, and upon chewing tasted like lemon too. Did this end up with the wrong label? Are they simulating neither fish nor chips, but the squeeze of lemon on top? The closest to edible so far, but not even close to a win. I'd saved the presumably strong Red Bull variety for after the vinegar, but I don't think I needed it to rescue me after all. Without a hint of taurine in sight this smells and tastes like the normal rainbow rock, maybe a bit milder. This was almost nice. Almost. Has letters through it saying RED BULL unlike all the other ones. I suspect that the makers of the drink won't be bringing a lawsuit - unless it's something to do with not actually being connected to Red Bull at all. To finish we have Traditional Pink - This is as expected, minty and too sweet. Again this has letters through it saying BLACKPOOL. Again - just a bit too sweet and crumbly to be actually nice. Pleasant enough. I'd put this in second place to the Red Bull, which are the only two I'd realistically encourage other people to try. I did leave the other flavours in the communal snack area at work and will see if anyone is brave enough to find out that the fish one is actually lemon. I paid a pound, and I got a pounds worth of sugar, additives and memories. Seems fair. I've noticed some work colleagues breaking open tins of various fish in sauce and adding them to ready made salads in their lunchboxes. I have added various fishy tins into salads before at home. I don't mind doing this, but I always feel the fish and sauce flavours disappear in amongst the various bits of salad. So I prefer to crack open a tin of fish on the side and delve into it with a fork whilst I eat my sandwich, crisps, etc. Anyway, I've tried various tins of fish and usually prefer fish in a spicy tomato sauce or mustard. 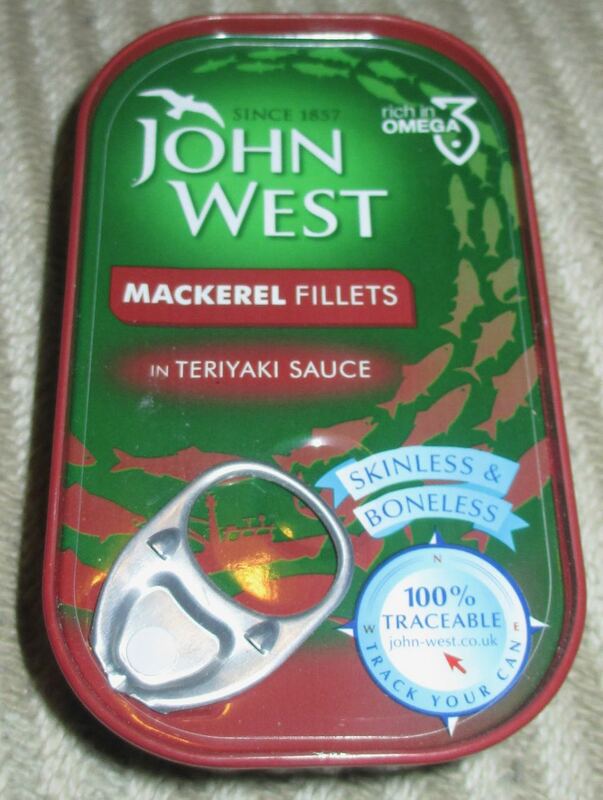 However, I picked up this John West Mackerel Fillets in Teriyaki Sauce from the long line of slightly daunting shelves rammed full with a sparkling array of varieties of fish in tins. I left it on the Foodstufffind's shelf for a while, munching away at various other stuff until I picked it up this lunchtime. Oh my, I should have picked it up sooner and then gone back to the supermarket and emptied the shelf. If ever I had any doubts before, this is the best tin of fish in sauce I've ever picked up. Not only would it go well in a salad, as there is plenty of sauce for the large pieces of mackerel swim around in, and to douse your green leaves, but the teriyaki sauce is so tasty and authentic. I've had teriyaki in various restaurants with a variety of different meats, but never with mackerel. It feels like teriyaki was made for mackerel, they go together so well. The fish doesn't overpower the sauce and the sauce works perfectly well with the fish. Oh so well. I can't praise it enough. This is the fish in sauce tin for me. 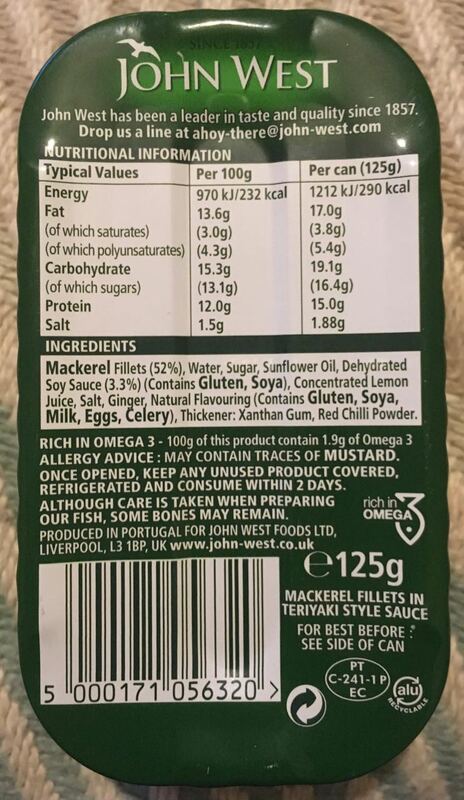 The 125g fish tin contains 290 calories, 17g of fat, 16.4g of sugar, and 1.88g of salt. The ingredients include; mackerel fillets, water, sugar, sunflower oil, dehydrated soy sauce, concentrated lemon juice, salt, ginger, gluten, soya, milk, eggs, celery, thickener; xanthan gum, and red chilli powder. I spotted these in Asda and didn’t at first realise that they were made by Seabrook. 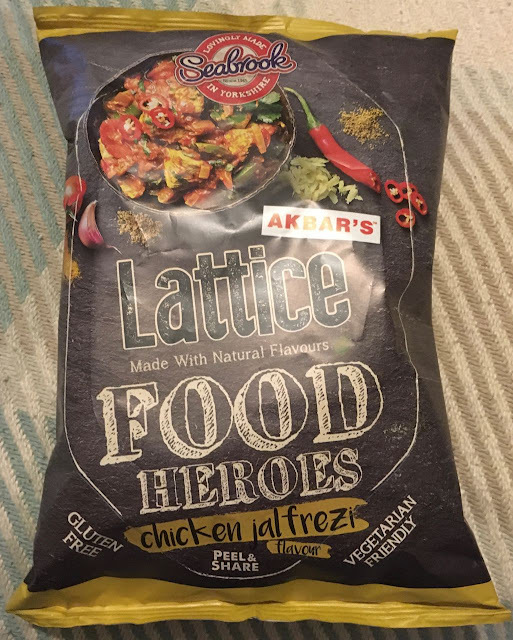 The packaging is quite different to what I’d expect from the brand, and it seems they are part of a Food Heroes range where the flavours are inspired by people. This one is officially Akbar’s Chicken Jalfrezi, I don’t mind who inspired it, I just hoped they were good. The new bag from Seabrook opens in quite an innovative way, where you unseal and open the middle. It is sticky too, so you can have a few and put them away until the next day. I liked this easy to share bag and I hope it catches on. The crisps are in the lattice style, this makes them light to munch on, but that they pick up lots of seasoning in their nooks and crannies. The flavour tasted remarkably authentic. These are not just a generic curry flavour, they had wonderful full on spices, from the garam masala to the lovely hint of onion. The chilli kick was just right, it was very definitely present, but not overpowering off the other delicious flavours. I loved these crisps, they had a meatiness to them too, but the best part was the intricacies of the Jalfrezi flavour. It actually tasted like somebody had spent some serious time getting these just right. These were spotted on my recent Asda haul, and aren't something I’ve seen in my usual supermarket. 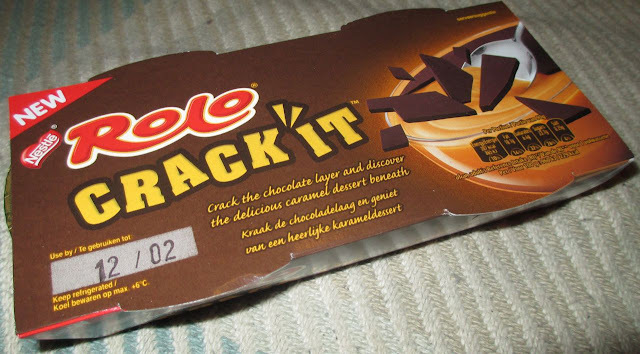 I’ve had a few chocolate “bar” themed desserts before but the addition of the ‘Crack It’ layer of chocolate sounded fun. Basically it is sealed with chocolate and you have to break this to get to the rest of the dessert. 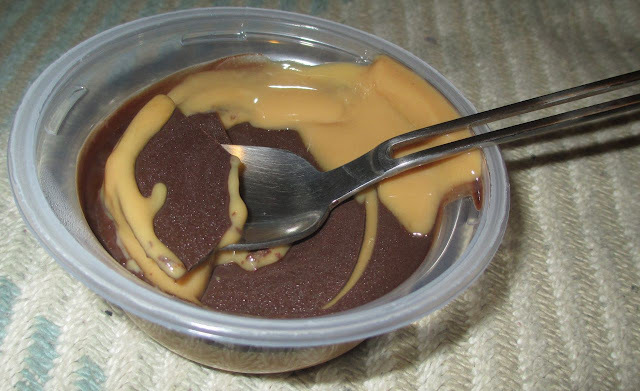 There are two desserts in the pack, and I opened up the first one and found that the caramel had already started to leak up and over the chocolate layer. I was a bit disappointed and when the second one was opened it was exactly the same. I’m not sure how common this is but ours were looked after fairly well on their journey from the supermarket to the fridge at home. 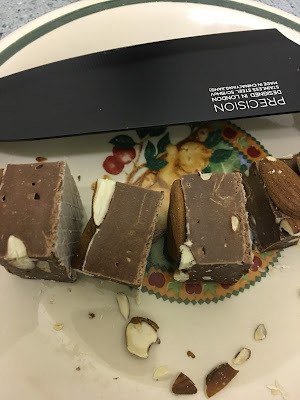 There was still enough chocolate to crack into, and I found it was quite firm so should’t really have broken before hand. In fact some of it was very difficult to eat from the edges of the pot, it was stuck solid. The flavour of the chocolate wasn’t the best. It was okay, it had some cocoa taste but wasn’t rich and luxurious. Underneath the caramel layer was fantastic. It was more liquid than solid, and the flavour was gorgeous. It had the wonderful golden flavours of sugary goodness and cream. The fantastic caramel taste worked like a dream. I’d buy these again for the caramel layer, but I think the chocolate seal didn’t quite work, despite being a nice idea. 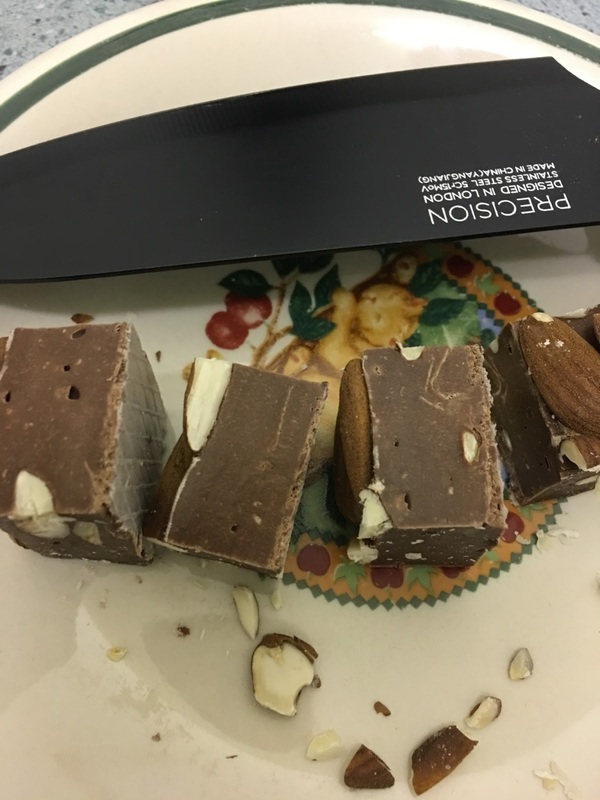 My Mom really liked Nougat when we were growing up. It was a massive treat to get a lovely fresh bar of the pink and white stuff - especially if it was so fresh it was still squishy. I still get nostalgic to this day when I eat some. 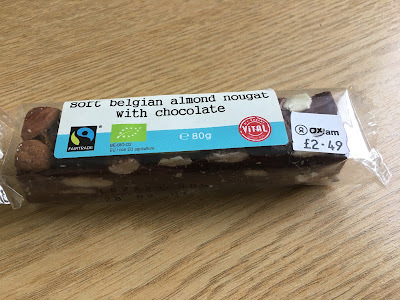 I spotted this in Oxfam, Lancaster while on holiday (a UK chain of Charity shops that I occasionally work in) - and although it's a little more than I'd expect to pay for an 80g bar it's for charity so I can't really be too upset when it feeds someone else as well as my sugar cravings. And look at all those almonds! It' really does look luxury compared to the scraps of nut I'd see as a child. I suspect that's because most people are fans of the sugar and not the almonds. I can eat bags of nuts quite happily and so this was destined to be something I'd be drawn to. As you can see I went for the chocolate variety just to see what that was like. I always preferred the pink over the white (like with marshmallows) but I felt just having a block of white may not be exciting enough. Cutting it required the mightiest of all the blades in the knife block but the persistence means that now there are bite size chunks. You can see the paper on the base now which I'd always called rice paper, but is actually potato starch! The texture was initially a bit hard, but as it acclimatised to the room and melted a little in my fingers it was more chewable. 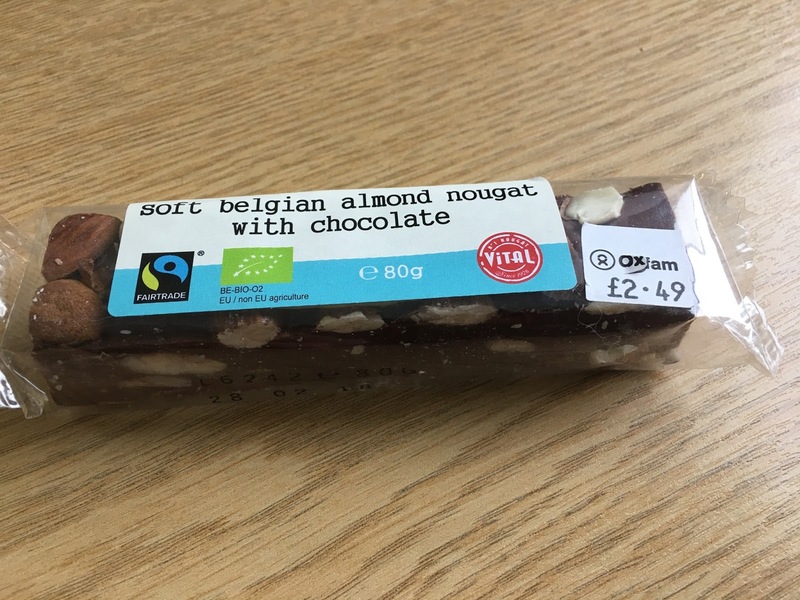 The nuts were totally the main flavour, but the chocolate tasted authentic and not artificial as I'd feared. I didn't need more than a few chunks so 80g was enough to share as a snack with a cup of tea. I'm not this is as suitable to pick up and bite off as i'd hoped while walking around the shops, but as something to take away and eat at home it's a nice little treat and something else (along with the Gnaw bars) that I'll be popping in to foreign Oxfam's to buy as our local one doesn't stock it. This stout is named after the high proportion of big cat sightings in the Cotswold Valleys surrounding the Stroud Brewery that it originated from. Possibly these are big cats used as exotic pets and then let loose after eating their owners, or possibly overweight house cats that have a habit of eating at too many people's houses as well as their owners. Maris Otter barley malt and organic barley malt were used in the brewing of this 4.5% volume stout, as well as organic hops. There was a heavy barley malt aroma on opening the bottle with hoppy bitterness in the background. This almost black stout filled my waiting beer glass with no small amount of menace. I could well imagine cat's eyes and sharpened claws in the darkness whilst walking through the valleys at night. Deep heavy malts dominate the initial flavour of this stout. They wash silently around the palate like a panther stalking its prey. There is sweetness from the chocolate malt, and a slight taste of coffee. Then there's a punch of bitterness from the hops as the Big Cat pounces. The coffee and chocolate flavours wrestle back the calm of night smoothing out the flavour of the stout as the Big Cat finishes its prey. Yum. Beware the hungry moggy at night I say! I know I’ve been buying quite a few Oreo products recently, but I spotted them all on my recent trip to Asda, a supermarket I don’t get to as often as I would like. So yes I stocked up with lots of goodies, and a trolley overflowing with all sorts of items for Foodstuff Finds. 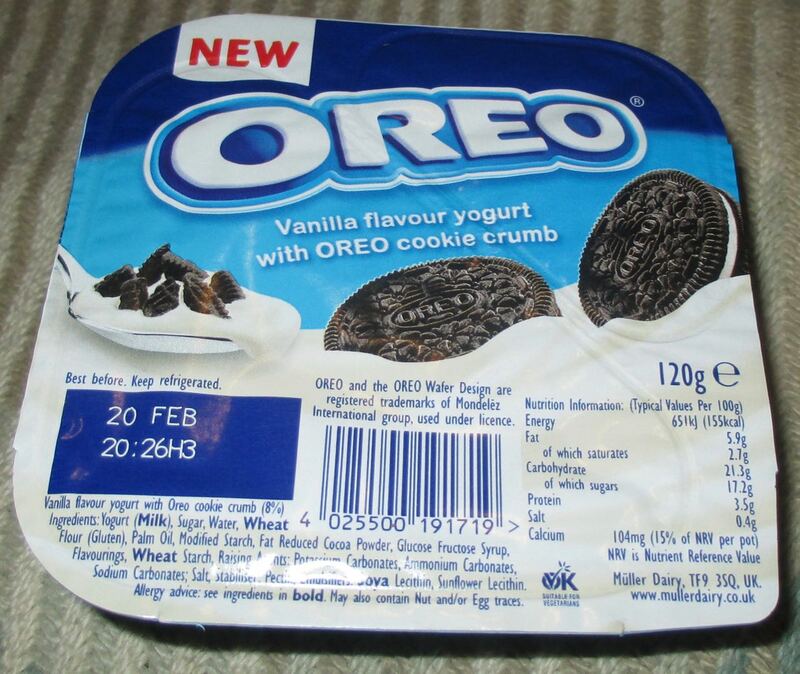 These yoghurts are corner yoghurts and have a vanilla yoghurt one side and an Oreo biscuit crumble the other. 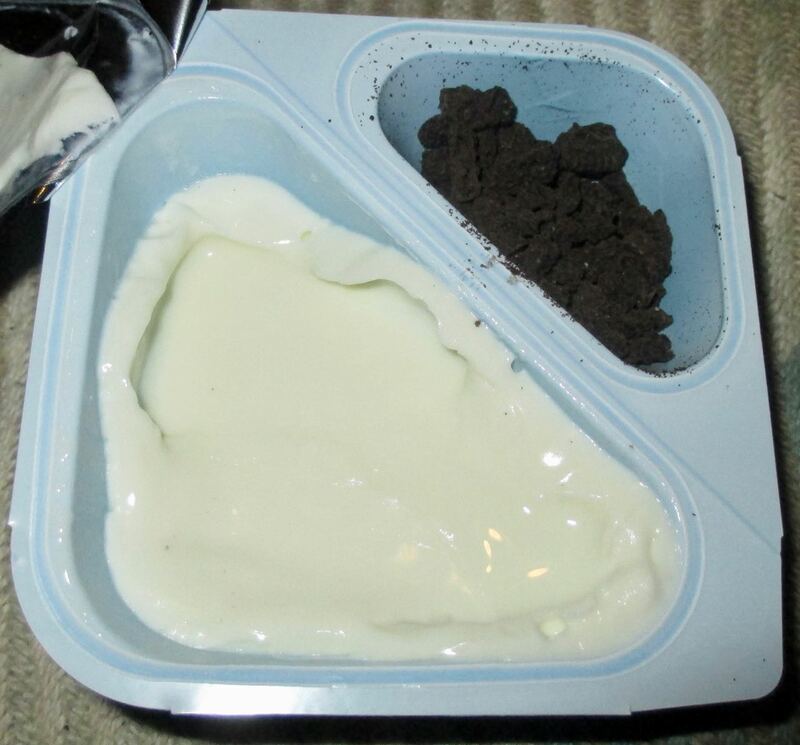 There are four yoghurts in the packet. When I opened them I had been expecting to find Oreo bits in the biscuit side complete with the ‘stuff’ filling, but it was just the dark biscuit that was in there and it was broken up into a crumble. This makes sense too as the vanilla yoghurt makes up for the missing vanilla ‘stuff’ filling. The biscuit crumble was a generous portion, and I tipped it into the yoghurt and gave it a stir. The biscuit maintained its crisp and crunchy texture even when coated with the cool smooth yoghurt. The two flavours worked really well together, and I liked the mix of textures. The yoghurt had a very distinctive Oreo flavour, and it was very enjoyable to eat. The yoghurt was good and thick and the coated pieces were a delight. Who knew biscuits and yoghurt would work so well together? It is just a shame I only picked up one multi-pack, because I’m already wishing I’d bought more! I was visiting friends the other day and one pointed these bars out in his local paper shop. I'd not seen them out and about (initially these were Amazon exclusive) so picked it and the Mars version up to review. After finding the bill for both was £3.90 I regretted it somewhat - surely it's a pound for something like this! Inside it looks a bit like a Snickers that someone forgot to put all the ingredients in. When you bite into it it's got the odd peanut, but frankly nothing close to what I'm after! It's basically a Milky Way that they didn't whip as much, with a few peanuts inside. It smells like a Snickers which now has me questioning whether that is just artificially added here, or on the normal bars too. Interesting. You get 18g of protein for your money, which is all from milk derivatives just as whey. A bag of mixed nuts requires you to eat 100g to get 18g of protein, but provides you with 500 Kcal compared to the 200 Kcal in the 50g bar here. I'm guessing the nuts are more nutritious generally too. I think it depends on your goals. 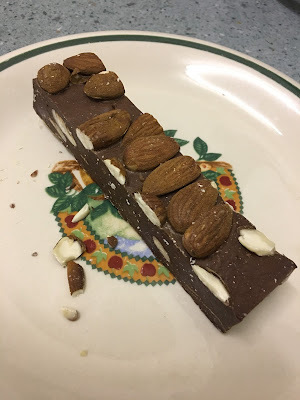 If you want to get as much protein per calorie as possible and you want that protein to mysteriously smell like a Snickers then this is the choice. If you want to pay less, get more nutrients per calorie (I'm guessing) and don't mind that it just tastes of nuts then I think the bag of nuts option would be better. It's not terrible, it's just a bit of bad science space food. I instantly liked the shape of the wavy brown and orange squares. 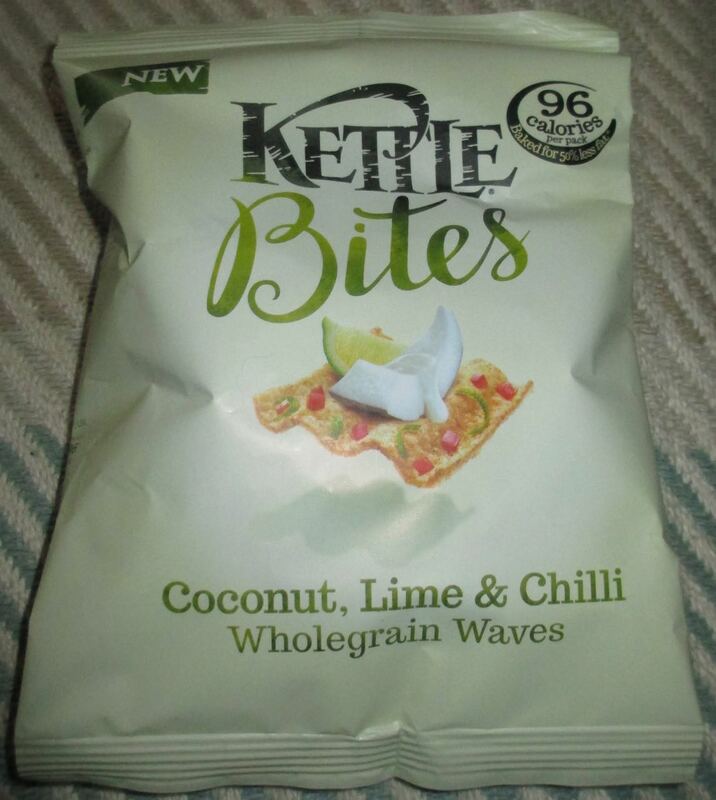 There was a hearty smell of ginger, coriander, chilli, lime and paprika from the waves inside the packet. On first crunchy taste I initially noted a wholesome mixture of spices with an undertone of a mild chilli heat. There was lime here too and quite strong in flavour taking over from the spicy chilli flavour with a tangy slightly sour citrus edge. Following on from the lime was tomato which broke on my tastebuds from the last wave of the ‘crisp’. I though these Kettle Bites Coconut, Lime & Chilli were very tasty indeed, the only downside was that with the multitude of spices, lime and tomato the coconut was overpowered and didn’t get much of a look in at all. However, having said that I would definitely have these again and am already looking forward to the next packet from the six-pack we bought from the supermarket. 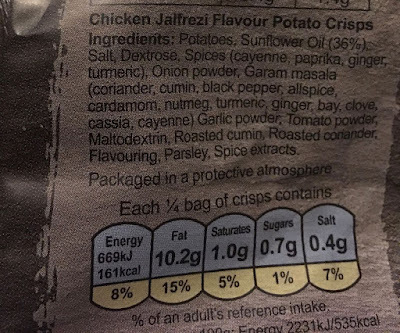 The 22g packet contains 96 calories, with 3.1g of fat, 2.2g of sugar and 05.g of salt. See photograph for ingredients. In the import section in Asda I found these rather interesting sounding Dill Pickle flavour Pringles. They looked like they should have been a taste sensation, and even promised an “extra-ordinary” flavour across the top of the tub. I really like gherkins in dill and vinegar as a side with a cheese and crackers, I find the dill flavour adds a lovely herby flavour and enhances the pickle. I opened up the tub and gave them the taste test. I think these meet the criteria of being the first pack of Pringles that once I popped I really could stop. The flavour didn’t “scream” at all, it almost had a hint of cardboard like taste. There was the mild flavour of vinegar and a herby dill hint, but the taste was very muted and they were quite dull. The herb taste didn’t work for me at all, and I usually like dill. I couldn’t get past the idea that the flavour was like a poor cousin to a zingy salt and vinegar. The background flavour was weird, and to me it didn’t taste like the pickles I love so much. Spectre ended up eating them up with a dip, but I quit even after trying that. Normally Pringles are so addictive, so I’m not sure what happened with these. This was the only variety of imported Pringles in my local branch of Asda, it is just that if I was only going to stock one import flavour of Pringles in a supermarket, these would not be them. I do like something sweet after my main meal in an evening. This doesn’t have to be a calorie laden dessert, sometimes a lower fat yoghurt is enough to suffice my sweet tooth. 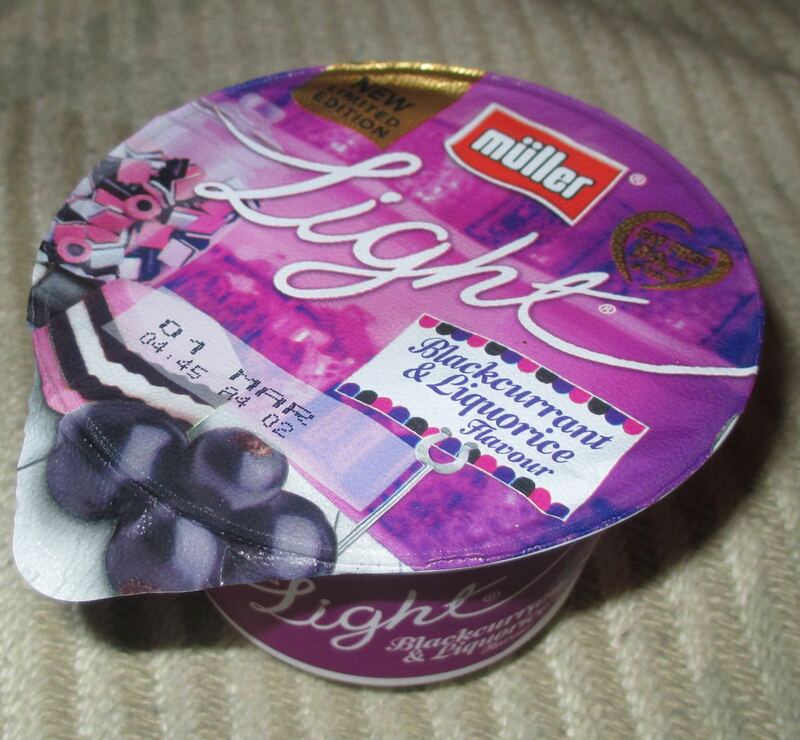 On my wander around Asda I thought I’d see if there were any new flavours from Muller in their Light edition. I spotted this Blackcurrant and Liquorice variety and tentatively picked it up. I like blackcurrant, but don’t eat much liquorice at all, it's not that I don’t like the stuff, its just not a favourite sweet of mine. 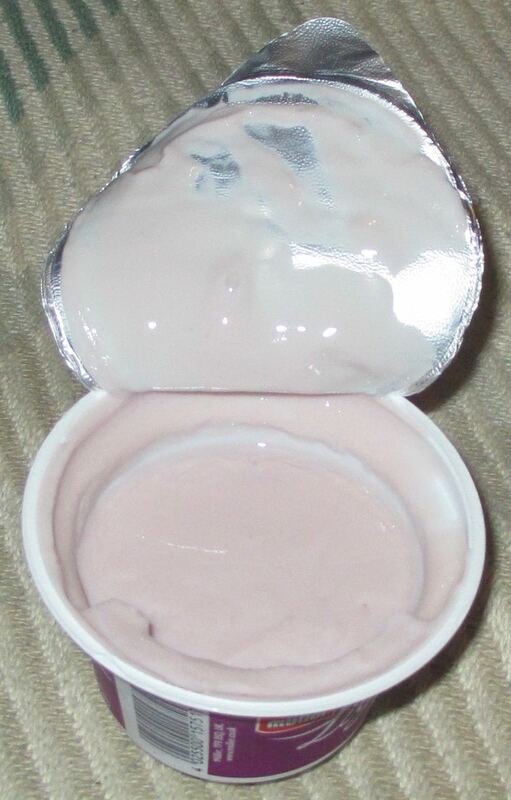 The yoghurt is a pale lilac colour, and looked and smelt quite pleasant. The texture is fairly thick (for a yoghurt) and very creamy. The flavour was sweet, but not too sharp. Blackcurrant dominated my tastebuds and the flavour was very pleasant. The liquorice taste added its dark flavour more as an aftertaste, and I have to admit it wasn’t bad, but it felt misplaced in a yoghurt. The more I ate the more I tried to work out what the flavour reminded me of, and the answer came as cough sweets. As a kid if I had a sore throat or cough the soothing sweets I was given were blackcurrant and liquorice flavoured, once I realised this I found it hard to get past it, and it meant that I probably wouldn’t buy them again. Thats the problem with taste, it is a very personal thing, and the complexities of what an individual does and doesn’t like is linked backed to experiences, which is why it is hard to please everyone! I shouldn’t complain, the yoghurt flavour did what it said on the tin. Blackpool in February is a little bleak. The rollercoaster are not yet rolling, and even the Stag nights and Hen parties are not yet out in force. Late one evening we expected to be able to grab a quick takeaway of chips from the famous Harry Ramsden chain, now underneath the Blackpool tower. It was very closed, and so we carried on round the corner into the restaurant itself, literally underneath the ballroom that we had tea in the day before. We ordered our food after reassurances from the staff that they were definitely still serving. We were the only customers there when our food arrived! As it was late we just had the classic double fried chips and beans (or peas in my partners case). They came with all the expected sauces and were cloaked in newspaper style wrapping. Oh and you can just see the onion rings hiding at the back. These were actually quite delicate and nice and well worth adding to dip in the beans. The chips were freshly fried and crispy and fluffy exactly how chips should be. Even though the staff would clearly get to go home as soon as we left we were not rushed, and the staff even had to unlock the door to let us out! While Harry Ramsdens is probably not most people's first choice of Blackpool location for an after hours lock-in I think that the newly refurbished restaurant is perfect for a get together with friends. Or in our case for the traditional chips by the seaside on the final day of the holiday.